Starring Robert Downey Jr., Chris Evans, Chris Hemsworth, Scarlett Johansson, Mark Ruffalo, Jeremy Renner, Samuel L. Jackson, Elizabeth Olsen, Aaron Taylor-Johnson, Paul Bettany, Cobie Smulders, Andy Serkis, Thomas Kretschmann, Don Cheadle, Anthony Mackie, Hayley Atwell, Idris Elba, Linda Cardellini, Stellan Skarsgård, Claudia Kim, Julie Delpy, Stan Lee and the voice of James Spader. Distributed by Walt Disney Pictures. 141 minutes. Rated PG-13. The question has been burning in the hearts of fanboys since Joss Whedon’s The Avengers became one of the biggest movie hits ever – how is he going to follow it up? Well, now that Avengers: Age of Ultron is here, we know the answer is more of the same. Much more of the same. Arguably too much more of the same. Which is not necessarily to say that Avengers: Age of Ultron is a bad film, though it is not nearly as effortlessly enjoyable as the first Avengers film. It’s just to say that Ultron feels a little overstuffed and overwhelming. Age of Ultron is on full CGI overload, a long series of flashy but slightly repetitive Michael Bay-style fight scenes, periodically broken up by brief scenes of talky exposition. Perhaps, this schizophrenic quality is even somewhat necessary. With about ten lead Avengers (plus their secret identities), four villains and dozens of other people popping in and out at any given moment the storyline, even at an overlong two and a half hours, the story is going to be stretched tight. Particularly when you consider that the Marvel universe has so many moving parts that are pulling into different directions. However, this time out the Avengers don’t so much feel like a team fighting for justice and the American way as it feels like a bunch of characters fighting for airtime. Robert Downey Jr.’s Tony Stark/Iron Man and Chris Evan’s Steve Rogers/Captain America are the yin and yang of the latest film, with Stark’s cynical multibillionaire butting heads with the more pure-intentioned Cap. The film even has some surprises around the characters – some good (Hawkeye’s surprisingly placid home life) and some not so good (a totally-out-of-nowhere new romantic tension between The Hulk and the Black Widow). And Chris Hemsworth’s Thor is kind of wasted here, though Hemsworth’s performance as the character is just getting more nuanced and fascinating. The best thing that Age of Ultron did was hire James Spader to voice the title villainous character, an artificial intelligence robot born of Stark’s conflicted mind whose prime directive is to get rid of all fighting – and takes that as a reason to get rid of the Avengers as well. (Which, honestly, is not such a huge leap for the robot to make.) Spader’s trademark vocal gymnastics and wordplay make the character seem much more interesting than Ultron actually is. 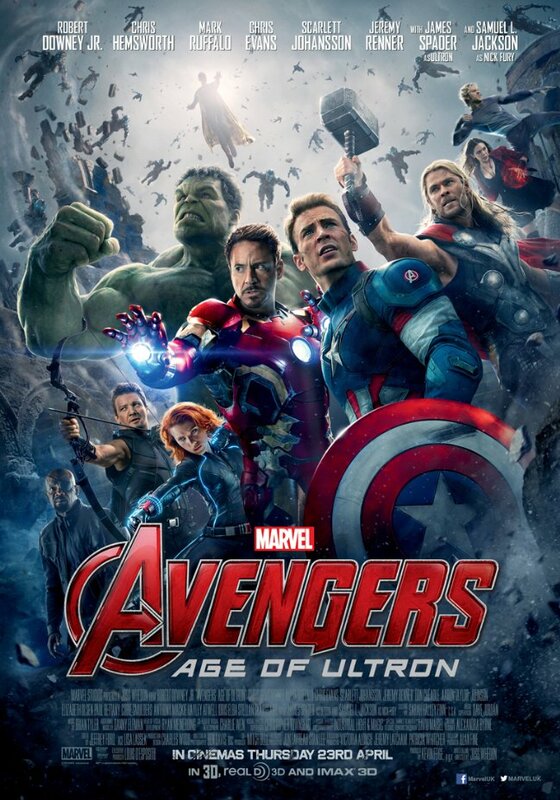 Avengers: Age of Ultron is a stunning looking movie, has plenty of popcorn thrills and does even have a few intriguing scenes of human interaction. However, it feels like a fairly inconsequential – though very action packed – expository chapter in the middle of a much longer story. As the sequel to one of the biggest blockbusters ever, I think everyone was expecting a lot more. Tags: Aaron Taylor-Johnson, Age of Ultron, Andy Serkis, Anthony Mackie, Avengers, Bruce Banner, Captain America, Chris Evans, chris hemsworth, Claudia Kim, cobie smulders, Don Cheadle, Elizabeth Olsen, Hawkeye, Hayley Atwell, idris elba, iron man, james spader, jay s jacobs, Jeremy Renner, joss whedon, Julie Delpy, linda cardellini, Mark Ruffalo, movie review, Paul Bettany, PopEntertainment.com, Robert Downey Jr., Samuel L. Jackson, Scarlett Johansson, Stan Lee, Stellan Skarsgård, Steve Rogers, The Black Widow, the hulk, Thomas Kretschmann, thor, Tony Stark, Ultron. Bookmark the permalink.